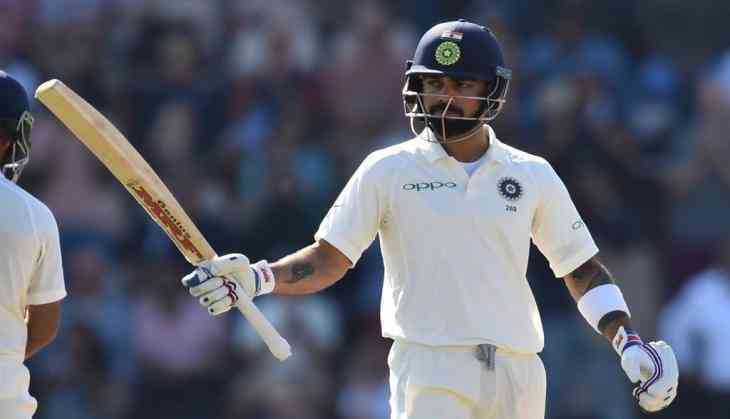 Virat Kohli breezed to a 24th Test hundred while Rishabh Pant missed out after a blistering 92 as India amassed 506 for five at lunch on day two of the series opener against the West Indies here on Friday. Kohli, who was 72 not out overnight, took time to knock off the 28 runs needed for yet another hundred while his partner Pant (92 off 84), who resumed at 17, went all guns blazing. Kohli (120 not out) had the company of Ravindra Jadeja (19 not out off 33) when lunch was taken. India, aiming to bat only once in the game, scored 142 runs in 29 overs bowled in the session. Kohli enjoyed his teammates' fluent strokeplay from the other end as Pant raced to his half century with a four and six off pacer Paul. He used his strong wrists to get to the desired elevation and distance. It was a sheer display of brute power. Pant was on 87 when Kohli raised his bat but the wicket-keeper batsmen ended up throwing it away as he went for another six.